Evidence-Based Psychotherapy Practice in College Mental Health presents an overview of EBP theory, research, and practice with a focus on the key issues in this growing field. The book features individual chapters on depression, anxiety, eating disorders, and alcohol abuse, and includes a special section on training in EBP through college counseling center based practicums and internships. Contributors address common concerns and issues about EBP and present recommendations for future practice and research in college counseling centers. College counseling center administrators and staff face the increasing challenge of providing services that address the unique stresses and dynamics facing students who often deal with multiple co-existing disorders as well as the normal developmental challenges of adjusting to college life. Evidence-Based Psychotherapy Practice in College Mental Health provides mental and behavioral health professionals with insight into the considerable contrast between theory, practice, and research in EBP as they evaluate its effectiveness on campus. The book looks at which evidence-based methods are currently used for clinical assessment and treatment, how evidence-based approaches apply to the therapy practiced on most campuses, and what the implications are for practice and research in university mental health settings. 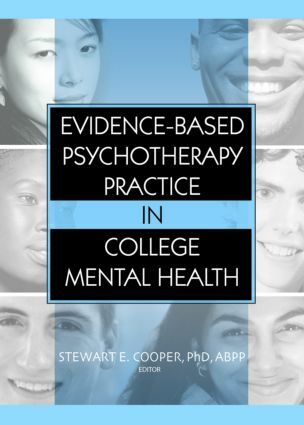 Evidence-Based Psychotherapy Practice in College Mental Health also offers suggestions for college counseling center clinical supervisors on how to incorporate EBP training while balancing common concerns about the applicability of EBP in working with college students. This unique book is an important resource for all practitioners working in university settings—from practicum students to seasoned professionals.